In an excerpt from his new book, “Screw Business As Usual,” Sir Richard Branson says that there has never been a more exciting time to explore this next great frontier, where the boundaries between work and higher purpose are merging into one, where doing good really is good for business. Over the last few decades as I’ve started up one exciting business after another, I have often thought that life and work could not get any better. In writing this book, however, I’ve come to realize that we’ve really been on a dummy run, preparing ourselves for the greatest challenge and opportunity of our lifetime. We’ve a chance to take a shot at really working together to turn upside down the way we approach the challenges we are facing in the world and to look at them in a brand new, entrepreneurial way. Never has there been a more exciting time for all of us to explore this next great frontier where the boundaries between work and higher purpose are merging into one, where doing good really is good for business. In this book I’ll share some great stories about people who are already leading the way. We’ve learned a great deal from some of these pioneers as the Virgin Group continues on its journey to transform itself into a force for good for people and for the planet. I’ll also share some of our own Virgin Group stories and, I hope, help you learn from some of the many successes and (yes we do have them at Virgin too) the occasional failure we’ve had along the way. First and foremost, I have written this book for the new wave of emerging entrepreneurs as well as for existing business people who are transforming their organizations, at the same time as trying to develop a business and to make a living, trying to do more to help people and to help the planet. It reflects a vibrant and very marked sea change from the way business always used to be done, when financial profit was the only driving force. Today, people aren’t afraid to say, Screw business as usual!–and show they mean it. James said. ‘They have a more balanced view. Just making money, in order simply to give it away, is out of date. There’s a massive generational shift occurring that will blur the distinction between doing good and doing business.’ I couldn’t agree more. I constantly meet a growing army of entrepreneurs around the world, and when they ask me if I have one single message which will help them, I tell them it’s this: doing good can help improve your prospects, your profits and your business; and it can change the world. It’s amazing how I keep coming across the same message, from bustling global cities, small towns in rural England, to the townships of South Africa and to small villages in India, to G8 climate conferences, to new medical centers, to schools. And the message is the same everywhere: we must change the way we do business. In the townships enthusiastic young people are grabbing opportunity by the scruff of the neck to develop their own businesses as a way out of poverty; women in small villages are funding new opportunities with loans as tiny as $15 from microfinance organizations; entrepreneurs in emerging markets are creating enterprises that respond to issues such as lack of sanitation and electricity; successful businesses such as cleaning care company ‘method’ are emerging and existing giants such as GE have made millions by reinventing their product offerings–at the same time as protecting the planet. Now I am sorry if this is going to smack of the ultimate in name-dropping, but this is a subject that is also discussed at Buckingham Palace. (This reminds me of a lovely joke Archbishop Desmond Tutu once told me: ‘People keep accusing me of name-dropping. Only last week I was at Buckingham Palace and the Queen said to me, “Arch, you’re name-dropping again.”‘) Anyway, I was recently fortunate enough to be invited to dine there with a cross section of guests to meet Barack Obama and what was it that the Queen and the President of the United States were talking about so animatedly? They were discussing climate change and foreign policy challenges in Afghanistan, Pakistan and Libya, as well as the best ways to address declining living standards and to rebuild post-crash economies. It’s no mere coincidence that so many people are talking about the same thing, and, more interestingly, driving the change. They are doing so because, in our newly interconnected world, no one can any longer ignore the issues we are facing. The best bit is that people are finally starting to realize that it’s not about throwing charity at issues–it’s about working in partnership with people on the front lines to turn those issues into opportunities. Change is happening. People often associate me with challenges, with trying to break records and occasionally my neck by sailing the Atlantic or flying a balloon in a jet stream at two hundred miles an hour, or going into space with Virgin Galactic. But this book isn’t just about fun and adventure and exceeding one’s wildest dreams (although, of course, there will be some of that!). It’s a different kind of business book. It’s about revolution. My message is a simple one: business as usual isn’t working. In fact, it’s ‘business as usual’ that’s wrecking our planet. Resources are being used up; the air, the sea, the land–are all heavily polluted. The poor are getting poorer. Many are dying of starvation or because they can’t afford a dollar a day for life-saving medicine. We have to fix it–and fast. Even people who say they don’t believe in climate change, or who simply don’t care about pollution, poverty and war–out of sight for them is out of mind–admit that people everywhere are mucking up things. Read Fast Company’s interview with Branson. Excerpted from Screw Business as Usual by Richard Branson by arrangement with Portfolio Penguin, a member of Penguin Group (USA), Inc., Copyright © 2011 by Richard Branson. 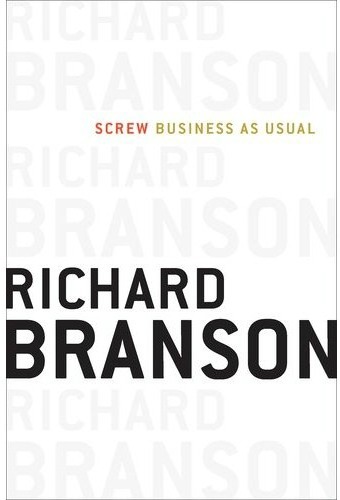 Richard Branson is the chairman of Virgin Group and the author of Screw Business As Usual.